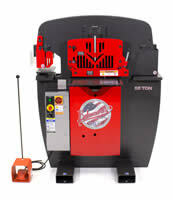 The 55 ton Edwards Ironworker is the most popular of the Edwards line. In addition to a powerful punching station the 55 Ton ironworkers includes a flat bar shear and angle shear. Optional tooling can be added in the open station, like pipe notcher, coper notcher and more. The 55 ton unit has plenty of power to drive the * * Powerlink System. So this ironworker has the combination of most commonly used tooling, the power to use them and the ability for expansion with additional ironworker mounted tooling and driving other hydraulic too with the Powerlink System. No wonder it is the most popular. “IN STOCK” Ready to ship today! 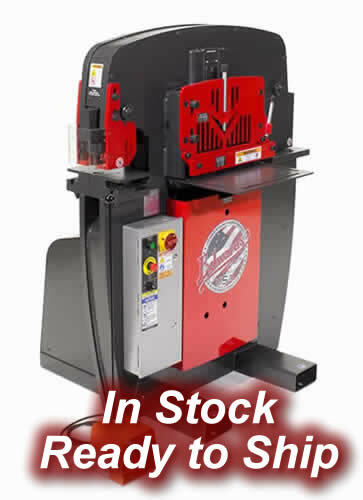 55 Ton Edwards Ironworker - with PowerLink System InstalledI -In stock at Production Specialty Ship today! Rod Shear 7/8 Round 7/8 SQ. Here's A Great Configuration Idea To Speed up production our customer installed a second punch unit on his 55 Ton Edwards Ironworker. This company is a manufacturer of utility trailers. These are the flatbed trailers available to attach to trucks and cars. They are fabricated out of angled steel parts joined together. The bed and sidewalls can be composed of either expanded metal or 2 x 6 timber. The steel angle requires two different sized punched holes for attachment. 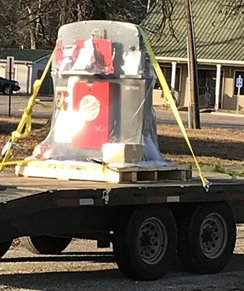 By adding the second punch unit to the 55 Ton Ironworker's Open station he saves significant time which would have been spent changing punch dies. Jobs go through faster to meet distributor demands. ** The Powerlink System allows this ironworker to power accessory tooling: 10 or 20 Ton Shop Press, 10 Ton Pipe/Tube Bender, Pipe, Tube & Section Radius Roller. Powerlink System is an option that must factory installed on new ironworkers. * Free shipping in continental US only, additional charges for Alaska & Hawaii. Pedestal Die Table Punch is the standard on the 55 ton Edwards Ironworker. 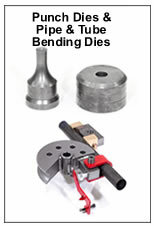 It allows for the punching of flange/web surfaces of 2″ steel angle, channel & beam. 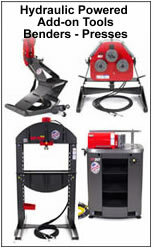 This ironworker will punch through 5/8 steel with up to 1-1/16 inch hole. Flat Bar Shear The standard on the 55 ton unit will shear up to 14 inches wide (3/8″ thick). Angle Shear The 55 ton Edwards ironworker angle shear will cut a 3 x 3 x 3/8 or 4 x 4 x 1/4 inch angle. Ques: Will this ironworker punch 2″ angle iron. Answer: Yes – typically no problem. Hang leg without hole down front of pedestal die table… in some rare cases an offset die is available for tight spaces. With an oblong punch and die set it will be no problem. Call Jason for details and pricing.